Chinese FDI in the US declined to $4.8 billion in 2018: Last year Chinese companies completed acquisitions and greenfield investments in the United States worth only $4.8 billion, down 84% from $29 billion in 2017 and 90% from $46 billion in 2016. This represents the lowest level seen in seven years. Net Chinese FDI in the US was negative if one accounts for asset divestitures: Chinese investors sold $13 billion of US assets in 2018, mostly driven by deleveraging pressures from Beijing. Counting these divestitures, China’s net US direct investment was negative to the tune of $8 billion last year. 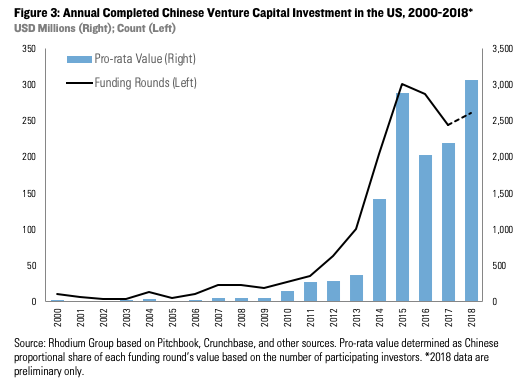 Chinese venture capital investment hit a new record in 2018: In contrast to the slowdown in FDI, Chinese venture capital financing in the US hit a new record of $3.1 billion in 2018 as investors were less impacted by regulatory hurdles. However, a slowdown in China’s technology sector and an expansion of US screening to include certain VC transactions present headwinds for Chinese outbound venture investment, some of which were already visible in the second half of the year. 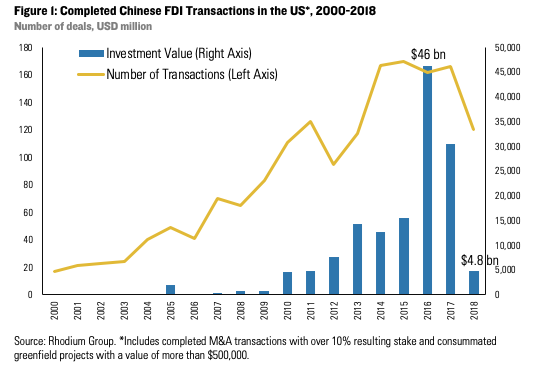 Pressures will persist in 2019: The pipeline of pending Chinese investments in the US is at a five-year low, and most hurdles weighing on China’s US investment are poised to persist or deepen: Beijing looks to continue outbound capital controls and its financial deleveraging campaign; Washington is moving to implement tougher screening of venture capital and other high-tech acquisitions; and the dark cloud over US-China relations is unlikely to disappear, although a major deal between China and the US could help revitalize investor appetite in sectors with low national security sensitivities. After dropping from a record high of $46 billion in 2016 to $29 billion in 2017, completed Chinese foreign direct investment (FDI) in the US took another plunge in 2018, dropping to just $4.8 billion. This represents the lowest level since 2011 (Figure 1). The number of transactions also declined (albeit less sharply), from 162 in 2016 and 166 in 2017 to 120 in 2018. Policy was mainly responsible for this continued decline. As we predicted, China has not meaningfully loosened outbound capital controls as its Balance of Payments situation remains fragile. Over the past year, Beijing’s deleveraging campaign has emerged as another important variable, curbing liquidity in the market and forcing private firms to prioritizing domestic debt consolidation instead of global expansion. In the United States, the Trump administration has actively utilized the Committee on Foreign Investment in the United States (CFIUS) to scrutinize Chinese acquisitions, pushing the number of Chinese transactions abandoned due to unresolved national security concerns to an all-time high. On top of that, trade barriers and a generally more confrontational stance toward China have created tremendous uncertainty for Chinese companies in the US, dampening investor appetite and increasing the risk perception of US sellers. 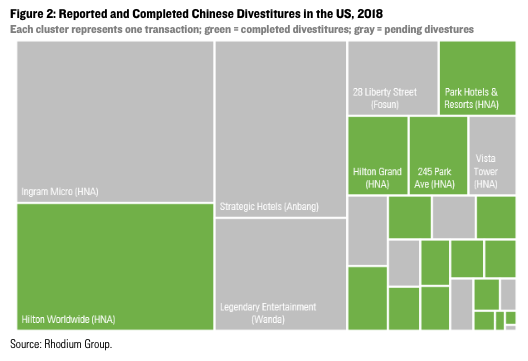 In addition to investing less, Chinese firm also divested assets at an unprecedented pace in 2018. This trend was driven by some of the most prominent investors that drove the 2015-2016 outbound investment boom as they have been forced to unwind their global holdings to clean up their books and reduce debt levels. We count a total of $13 billion in completed divestitures in 2018, and another $20 billion are still pending (Figure 2). Counting divestitures, Chinese net FDI inflows to the US were negative to the tune of $8 billion last year. In stark contrast to the FDI depression, Chinese venture capital (VC) investment in the United States continued to thrive in 2018. Annual investment (estimated as the pro-rata Chinese share of each funding round’s value based on the number of participating investors) climbed from $2.1 billion in 2017 to $3.1 billion in 2018 – a new record (Figure 3). The number of funding rounds did not change much year-over-year, but participation shifted to later-stage transactions at larger valuations. The biggest recipients were battery maker Farasis Energy (Fuzhou-based Industrial Bank of China and others) gaming company Epic Games (Lightspeed China Partners) and biotechnology firms Grail and Viela Bio (6 Dimensions Capital, Hillhouse Capital and others). At the beginning of 2019, the pipeline of pending Chinese transactions remains thinner than in previous years (only $5 billion, compared to over $10 billion at the end of 2017). The biggest pending deal remains Oceanwide’s $2.7 billion takeover of Genworth Financial, which has received CFIUS clearance and is expected to close in the first half of 2019. One bright spot is greenfield FDI, where we registered a noticeable increase in newly announced projects in the second half of 2018 in response to trade barriers, especially in basic materials, automotive and some consumer sectors. However, we expect most policy variables that dragged down Chinese investment in 2018 to remain in place in 2019. Beijing is unlikely to abandon its interventionist stance on outbound investment as climbing interest rates in the US will further incentivize capital outflows and add pressure on China’s balance of payments. While we see some partial relaxation of financial conditions, we don’t expect Beijing to leave the path of deleveraging and allow a return to conditions that helped fuel the previous outbound investment boom. This means Chinese firms will likely follow through with divestment of more than $20 billion of US assets that they have reportedly been seeking to sell. The implementation of the Foreign Investment Risk Review Modernization Act (FIRRMA) will further complicate the picture. FIRRMA reinforces a stricter application of national security screenings of Chinese FDI as well as non-FDI transactions (such as venture capital) in critical emerging technologies and critical infrastructure. Data from the last quarter of 2018 already show signs of preliminary impacts, for example a downturn in VC investments by Chinese corporate venture investors (whereas passive financially-motivated investments by professional VC firms are holding up better). Finally, the uncertain outlook for broader US-China economic relations will continue to weigh on investor sentiment. After several rounds of punitive tariffs and retaliations between the US and China, the two sides agreed on a 90-day pause in the trade war, and negotiations are still ongoing. The outcome of these talks will be an important variable for the 2019 outlook. If a sustainable solution is reached, we could see an increase in deal making in sectors that are not traditionally considered sensitive from a national security perspective such as consumer goods or healthcare.